Painted on the front panel of this fruit cooler is a view of England's great Worcester Cathedral with its fourteenth-century Gothic tower rising beyond the Severn Bridge; at the left are other landmarks- probably the tower of Saint Swithin's Church and the spire of Saint Andrew's Church. Exotic birds in a river landscape are pictured on the reverse panel. 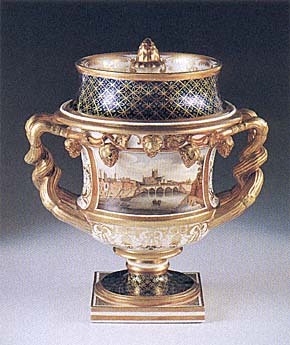 The dark blue urn-shaped vessel with gilt decoration comes from an English city noted for its fine porcelain ware. Worcester became a center for porcelain manufacture with the establishment in 1751 of the Worcester Porcelain Company, whose success gave rise to the creation of other such firms in the nineteenth century. The product of a competitive manufacturer, the cooler is from a dessert service made about 1820 by Grainger, Lee and Company, in business from 1812 to 1837. Thomas Grainger, a partner who had worked prior to 1801 as a ceramic artist for the Chamberlain factory at Worcester, saw to it that Grainger, Lee and Company became a leading source for richly decorated porcelain.